Special Containment Procedures: The anomalous areas of affect around SCP-1241 have been closed to all civilian traffic as of ██/██/██. All possible effort must be made to encourage that rerouting of traffic in those areas be made permanent. Infrastructure overhauls in ██████ County have assisted with this process. No attempt to relocate the two instances of SCP-1241 are to be made until the results of Experiment 1241-A prove conclusive. Foundation personnel assigned to SCP-1241 are forbidden from using any form of transportation able to achieve speeds above thirty miles per hour while within the area of affect of the anomaly as long-term effects have yet to be fully documented. In the event of civilian containment breach, utmost effort is to be made to deter approach to the anomaly: in the case of civilian entrance into the anomaly, Class-A amnestics are to be administered. 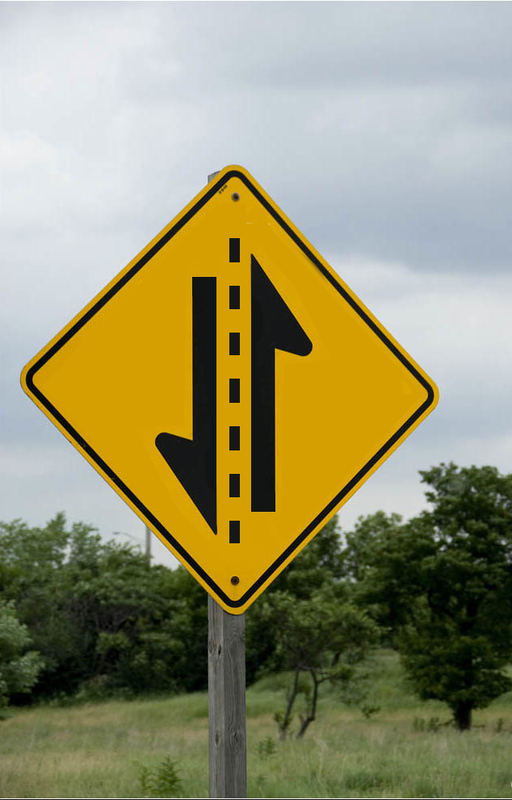 Description: SCP-1241 consists of two identical road signs that at first glance resemble merge-ahead road signs in the local area. However, the arrow is bisected along its length, with the left half vertically inverted. The two halves are divided by a dashed black line. The symbol in question is not found in any directory of local road signs. The signs are located on two similar stretches of highway roughly 150 km apart passing through ██████ County, one being a north-bound two-lane interstate and the other being a south-bound four lane turnpike. Despite the heavily foliaged roadsides, the signs are not concealed and are clearly visible as per county regulation. The anomalous effect of SCP-1241 occurs at an as-yet undetermined rate. Whenever a vehicle or physical body passes the sign while travelling in excess of thirty-five miles per hour, there is a chance for it to be displaced to the location of the other sign while maintaining its velocity. SCP-1241 was discovered following a series of violent and almost universally fatal car crashes: an investigation regarding the odd concentration of occurrences drew Foundation attention, and the area was isolated. A mundane explanation involving defective road materials was sufficient to satisfy local authorities and allowed for the cordoning off of the anomalous areas. Additionally, it served to draw public attention to the state of the roads in the County, greatly easing Foundation efforts for infrastructure overhaul to avoid SCP-1241’s anomalous effect. When removed from the roadside, SCP-1241 retains its properties for an estimated eighty-six minutes, at which point it becomes indistinguishable from a non-anomalous sign and an identical instance of SCP-1241 reappears at the previous location. While SCP-1241 is removed from the roadsides, no anomalous effects are retained, and the highway may be traversed as if normal. Procedure: Three autonomous vehicles traveling at 34, 35, and 36 miles per hour are driven past SCP-1241 repeatedly until the effect is triggered or two hours elapse. Results: First vehicle passed SCP-1241 without incident and continued along its path: vehicles two and three emerge with no physical changes at the second instance of SCP-1241. The same effect occurs in the opposite direction. Procedure: An African Ostrich is compelled to repeatedly pass the first instance of SCP-1241. Results: After the 12th pass, the ostrich is transported to the other instance of SCP-1241. Special Containment Procedures: Instances of SCP-1667 are to be contained in padded containers appropriate to their size, and stored in a standard containment locker at Site-██. Under no circumstance are any instances of SCP-1667 to be installed in Foundation light fixtures or otherwise charged with current. Description: SCP-1667 consists of a number of objects closely resembling fluorescent light tubes of the sort commonly used in office buildings throughout the United States. They have been been found, both in installed and uninstalled states throughout office buildings across the American continent. It is currently considered prohibitively expensive to isolate all instances of SCP-1667. The exact nature of SCP-1667 is still under debate, as it is yet unclear to what degree the SCP is to be considered alive. 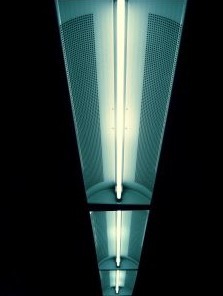 When inserted into a light fixture appropriate to the model of light that the SCP is duplicating, instances of SCP-1667 will at first seem to act like a standard fluorescent light, with the electric current stimulating light emission. There is no substantial difference in either brightness or hue as compared to non-anomalous lights. However, individuals exposed to the light of an SCP-1667 lamp will inevitably, after a period of 6-8 hours, report fatigue, eye pain, and a mild-to-severe headache. Careful observation has noted that during this period, SCP-1667 will brighten at roughly one lumen per hour. Both of these effects have proved to be, to a certain degree, cumulative, wherein extended or repeated exposure to the light will cause increased symptoms of fatigue, eye strain, and progressively worsening headaches, while over time, the light will continue to gain in luminescent strength. Once an individual has been exposed to the light from an instance of SCP-1667 for a cumulative period of around three hundred hours, these symptoms will become debilitating, and, if not deliberately kept awake, fatigue and pain will result in an unconscious state in the individual. At this time, the light's gradual increase in brightness will spike to a rate of twenty lumens per hour for half an hour. If the subject is not removed from the area of effect of the light during this period, they will fail to awake from their unconscious state and expire from brain hemorrhage. Further research has demonstrated that the additional energy for the brightening effect seems to through as-yet-undetermined means, directly come from the pain experienced by those under its influence. Subjects given pain-inhibiting substances, when exposed to an instance of SCP-1667, would complain about eye strain and fatigue, but the object would not increase in brightness. Blind individuals were found to not be affected, strengthening the theory that the adverse effects of exposure to the charged tubes is due to the light they produce. Special Containment Procedures: Radio waves that carry a poison.